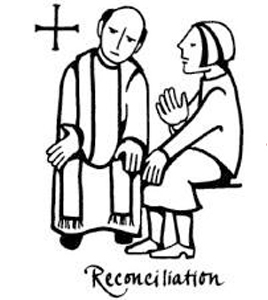 What is the Sacrament of Reconciliation ? The Sacrament of Penance is also known as the ‘Sacrament of Reconciliation’ or traditionally called ‘Confession’. It is the rite by which sins are confessed and forgiven. Sin is failure to recognise and love God in the way we think or act. Sin is also not just a failure to love God directly but also a failure to love one another. This is referred to as “the community sense of sin”. In this sacrament people are forgiven their sins by the words and actions of the priest. We call this ‘Absolution’. The priest represents God and the community who is affected by sin and the priest ministers forgiveness on behalf of God and the community. The sacrament can be celebrated in a one-to-one encounter with a priest: this is known as ‘individual confession’. Many parishes also organise ‘Penitential Services’ at special times; e.g. Advent, Lent and Parish Missions. In this form of celebration, which is communal, people prepare as a community and many priests hear the confessions individually and people receive absolution individually. Penance is a sign of sorrow and a commitment to try to make amends. It is also a sign of our sincerity to change our lives. This is what is meant by conversion. When the Sacrament is a communal celebration, the penance is said as a community, once all have had the opportunity to confess. When celebrated in the traditional one-to-one form, a penance is given and the person takes on that penance privately. Any person who has been baptised and prepared appropriately can celebrate this sacrament. To contribute to your Parish by Standing Order please click here and download the form. Many thanks for continuing to support our parish.